A leading Iranian cleric claimed that Iran has the technical knowledge to develop a nuclear weapon, but that it chooses not to because it is religiously forbidden. 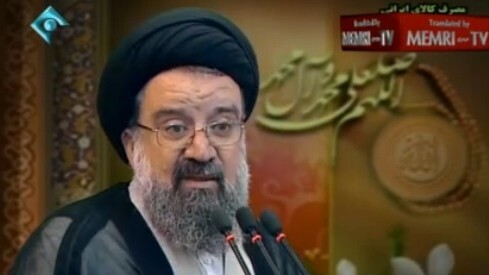 Ayatollah Ahmad Khatami told Iranian military personnel that the Islamic republic had the means to enrich uranium to levels needed for nuclear weapons, the Guardian reported, citing an official Islamic Revolutionary Guards Corp website. “[We] can enrich uranium at 5% or 20%, as well as 40% to 50%, and even 90%,” the paper quoted Khatami saying. The report gave no indication when Khatami made the comments to officers in the western Kurdistan province. Developing nuclear weapons, however, violated Islamic principles, he said. Khatami also said that Iranian Supreme Leader Ayatollah Ali Khamenei had nixed any discussion of Iran’s missile system in the ongoing nuclear talks since the US did not “follow principles,” according to the report. Referencing the Islamic republic’s ongoing nuclear talks with world powers, Khatami criticized Iranian President Hassan Rouhani for attempting to reestablish diplomatic relations with the US and for attempting to ban the use of the slogan “Death to America” at government-sponsored rallies. Khatami, a senior ayatollah who currently serves as the interim prayer leader in Tehran, has previously called the US a “hostile enemy” that should not be trusted, and has openly praised the violent 1979 takeover of the American embassy in Tehran. His comments were published days after a leaked confidential International Atomic Energy report confirmed that Tehran was honoring the interim 2013 agreement reached between the P5+1 powers to halt Iran’s uranium enrichment above a 5% concentration level. The IAEA document said that Tehran had not made “any further advances” at two enrichment facilities and a heavy water reactor which was under construction. The P5+1 powers failed to meet a November 24 deadline for the comprehensive deal on reining in Iran’s nuclear program in exchange for an easing of crippling Western sanctions. Nuclear talks between Iran and six world powers have been extended until July 2015.